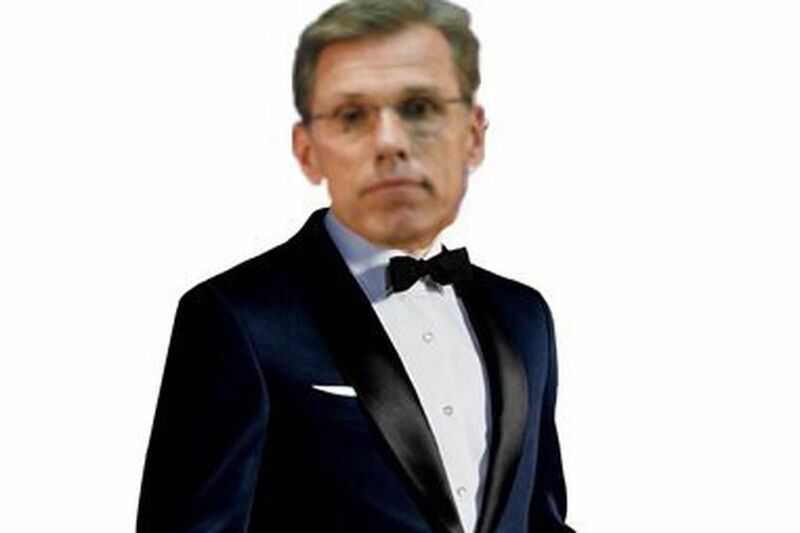 The name is Spielman. . .Rick Spielman. 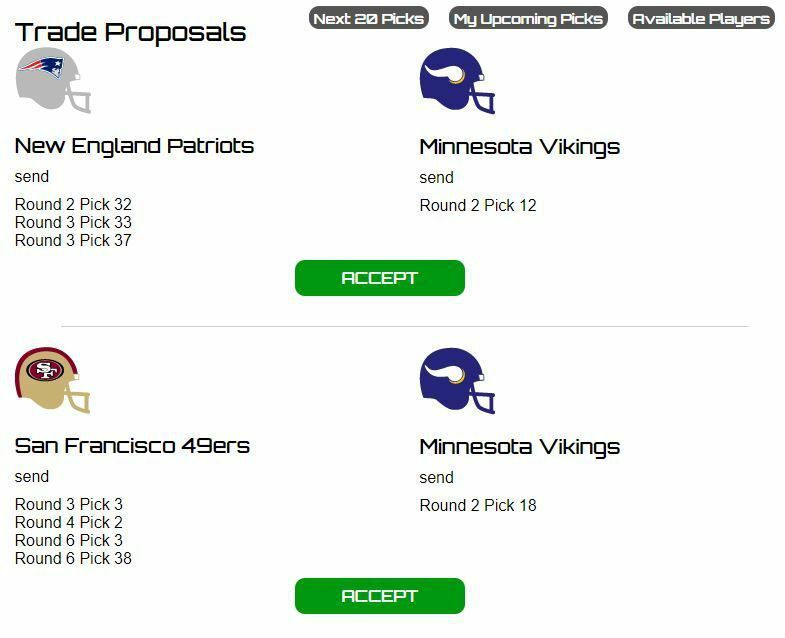 Yes, it is once again time for yours truly to fire up the FanSpeak On the Clock mock draft simulator and take another run at what a potential draft for the Minnesota Vikings could look like this April. As we did last year, Ted and I have been taking turns doing this, and we’ll be putting all of these mocks into a stream for you to find them all easily for comparison’s sake. For now, you can check out Ted’s first mock and his second mock, as well as my first mock, at those links there. So, let’s get into the mock for this week, shall we? 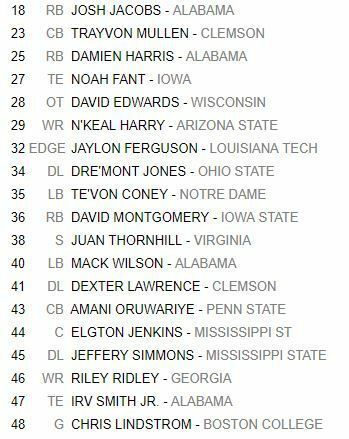 As the draft gets underway, here are the picks the Vikings currently possess, as the folks from FanSpeak have already projected Compensatory selections. Before the festivities get underway, I get two proposals, one of which presents an interesting conundrum. I’m going to completely ignore the Bengals’ offer, because again I have no interest in moving up here and certainly not at the expense of my second round pick. However, the Packers’ offer presents an interesting issue. Green Bay already has their first round pick at #12 overall, and they’re offering the pick they got from New Orleans last year and their second rounder to move up 12 spots. According to ye olde draft chart, the 18th pick is worth 900 points, while the value of #30 and #44 is a combined 980 points. So, from that perspective, I would be coming out ahead if I made that deal. On the other hand, it would allow a division rival to move up and potentially snag a piece that could help push them back into contention. 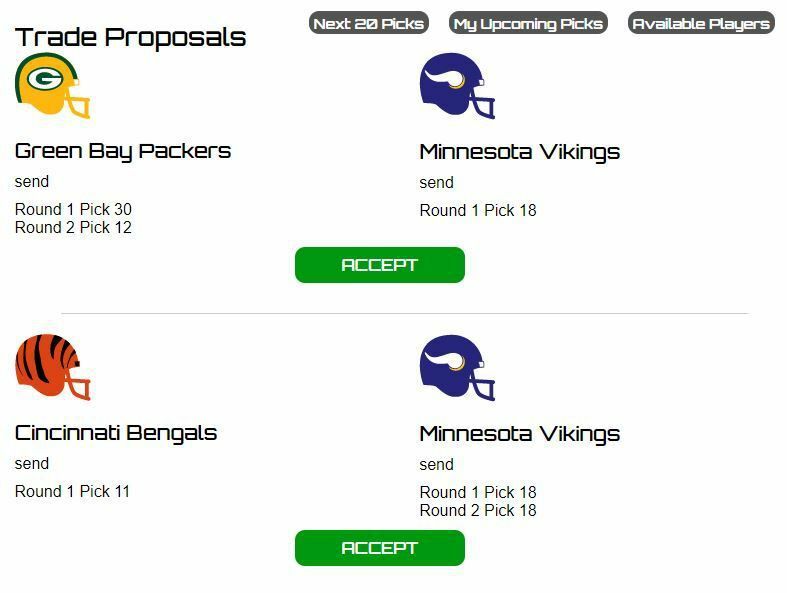 It’s something that you probably wouldn’t see in the actual NFL Draft, but you know. . .this isn’t the actual NFL Draft, so let’s roll with it and accept Green Bay’s offer. The DrafTek Big Board doesn’t appear to value offensive linemen very highly. 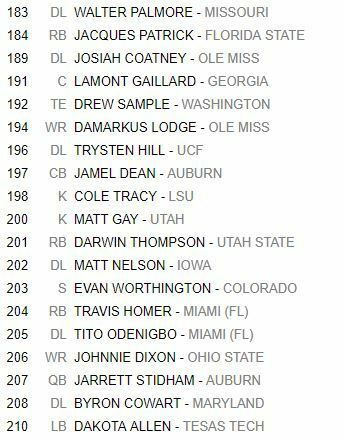 At this point, four have gone off the board (Jonah Williams to Green Bay at #11, Greg Little to Carolina at #16, Jawaan Taylor to Seattle at #21, and Martez Ivey to Houston at #23). Again, it looks like the sweet spot for offensive linemen is going to be Round 2, so that extra second we snagged is going to come in handy. So, with that in mind, and with the thinking that we’re going to address our primary need in the second round, let’s see if we can’t add a weapon for our offense. Fant is the sort of tight end that is going to present nightmare-level matchup problems for NFL defenses. Offenses in the NFL are becoming more friendly to “flex” targets, and Fant is just the sort of player that fits that bill. Fant might be the best athlete available in this draft at the tight end spot, and with the future of Kyle Rudolph in a bit of doubt for the Vikings, Fant could very easily be his replacement in a very short time. On to Round 2 we go, and as our new selection comes up at #44, I get a couple of trade offers. While both of these offers are intriguing, to be sure, this is the time to start hitting the offensive line need, and there are players that have fallen to this spot that will fill that need. 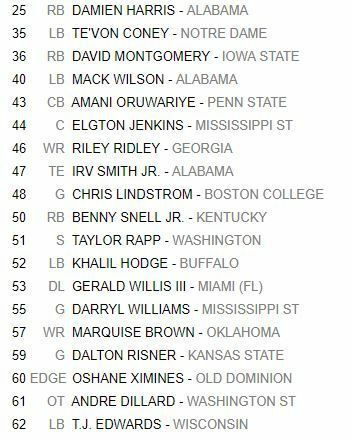 Yes, we pick again at #50, but since we need two offensive linemen (at a minimum), I’d rather see if I can get both of those taken care of here rather than risk missing out like we saw happen in the 2018 Draft. So, I turn down both offers and make my selection. 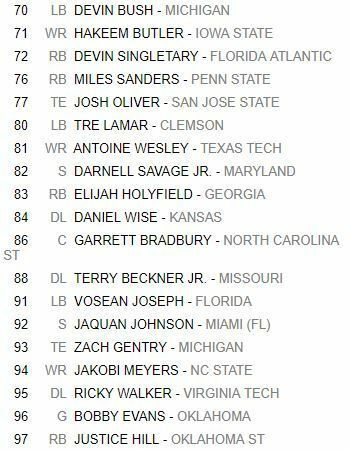 There are some very good offensive line prospects here, and rather than doing what I did in the last mock and draft someone that’s probably going to have to change positions, let’s just address the biggest need. Lindstrom isn’t a prospect that’s going to make anyone say “wow,” necessarily, but there really aren’t any flaws in his game. He’s got very good size (6’4”, 305) and movement skills, and would appear to have the ability to step in and start at either guard spot for the Vikings. He’s played tackle for Boston College in stretches as well, but would certainly be an immediate starter for Kevin Stefanski’s offense. Since the board hasn’t changed much when we get to #50, let’s fill the other guard spot, shall we? I don’t know about you, but that sounds pretty damn good to me. Well, when the guy you took at #18 in your first mock is sitting there at #81 in your second one, you have to take him, right? If you want my thoughts on Devin Bush, I’ve got them in my first mock. I don’t think there’s a snowball’s chance that he’s available to anyone in the third round, but hey. . .you play the cards you’re dealt, right? We’re on to “Day 3” of our virtual mock, and a couple of trade proposals come in. 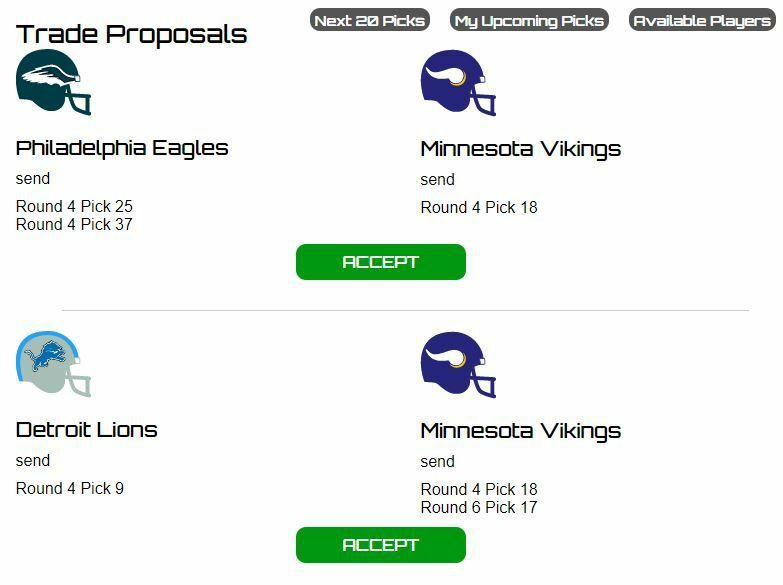 There’s nobody that intrigues me enough to move up for in this round, as far as I can see, but I can always Spielman my way into an extra pick, so let’s take Philadelphia’s offer and drop a few spots to pick up another fourth. That means we now have six more picks. . .two fourths, two sixths, and two sevenths. . .giving us the “magic number” of ten. In a Minnesota Vikings’ tradition in the vein of Ray Edwards, Brian Robison, and Everson Griffen, let’s grab an edge rusher in the fourth round. Nelson had a solid season for the Hawkeyes in 2018 with 9.5 sacks and 13.5 tackles for loss. He’s someone that should be able to work his way into the rotation for the Vikings relatively early on. With our second pick in this round, let’s swing back to the offense with a pick that could, eventually, pay off huge. I’m not sure where, exactly, Campbell would fit in the Vikings’ offense, but for a player like this, you find room. Campbell has all sorts of speed and could be used in any number of ways. He does have some issues with drops, but again. . .he could be a huge get at this point in the draft. Again, virtual Mike Zimmer wants a corner, and that’s still showing as one of our needs in the simulator here, so let’s fill that spot. Dean is a big corner (6’2”, 205) who had a very good season for the Tigers in 2018 despite playing all year with a cast on one hand. He projects best as a press-man corner, and I think we can safely assume that the Vikings can find a spot for him there. With our second pick in the round, we’re going to take a guy that the Vikings might not be able to use that much this year, but if they can stash him away and get him healthy he could be a big-time contributor down the road. Love was a Heisman Trophy contender in 2017, and his numbers dropped in 2018 as defenses were able to focus more heavily on him. He tore his ACL in December and likely isn’t going to be ready to do much this season, but he’s the sort of player that could pay huge dividends for the Vikings going forward when he gets healthy. On to the final round, with our two picks coming at the tail end of things. When we finally get back on the board at #249, here’s what we’re looking at. Our “needs” list says we need a safety, so let’s grab one. Gotta be honest. . .I don’t know a heck of a lot about the guy, but he’s the only safety left of any note, so let’s grab him. Last. . .literally, last, because this pick would be “Mr. Irrelevant”. . .I’m going off the board to fill the backup quarterback spot. We finish things off with the second-best quarterback in Bison history. . .behind Brock Jensen, naturally. So, that’s this mock, ladies and gentlemen. Here’s a look at who I wound up with during this session. 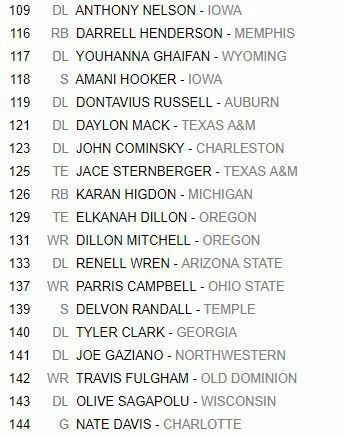 If you want to check out the entire draft, you can check it out right here on the FanSpeak website. 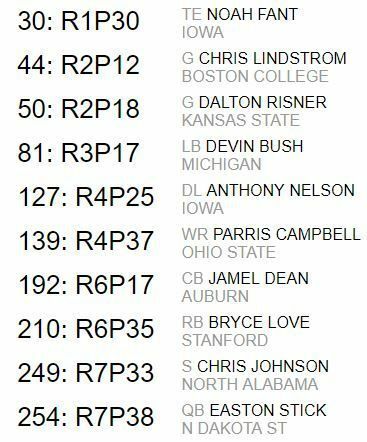 So, what do you think of my second mock draft of the offseason, folks? 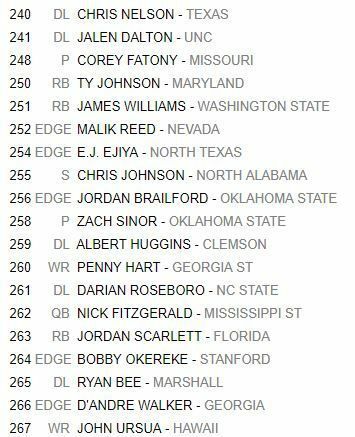 How would you grade Chris’ Mock Draft v2.0? It’s Rickspeak! 2019 Pre-Draft Edition When Rick Spielman talks, we listen. REALLY listen. Mid-Week Open Thread: April 24, 2019 Oops, I was off by a day yesterday. Make your draft predictions here! Whether it’s the Vikings or another team, let’s hear what you think will happen!